I realize it’s a bit early to be talking Valentines Day, after all we’re just heading into the new year. But if you’re of the crafty-gift-giving-sect then you’re probably like me and think a few holidays ahead. 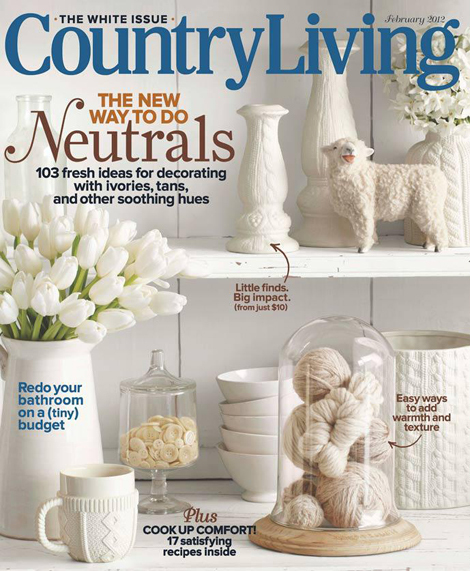 When crafting for Country Living magazine, I’m often several holidays ahead on the calendar. Today my February issue of CL arrived and I couldn’t wait to share my latest project with you. I designed an easy-to-make printable Valentine paper airplane for sending to the one(s) you love. It’s found on page 49. 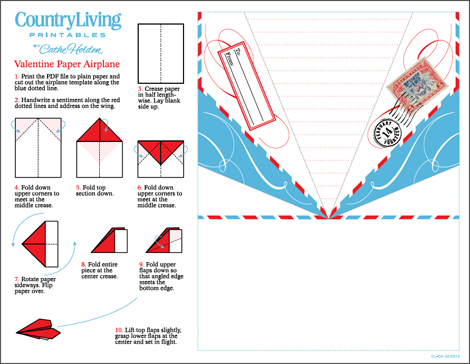 Click the image below to download the free PDF file of the Paper Airplane Valentine. Trim out the airplane graphic along the dotted lines removing the instructions, add your salutation and fold accordingly. Deliver. Done! Spice things up by adding a lipstick kiss or mist of your signature fragrance. Make early or add the link for the project to your calendar a day or two before February 14 and you won’t be caught empty handed for Valentines Day! This entry was posted in Country Living Magazine, Uncategorized. Bookmark the permalink. So adorable, thanks for sharing and for the preview! What a cute idea Cathe – love it! I read this as I was getting ready to sit down to my issue. Although, at first I thought it was different because mine has a different cover. I love the cover of yours because I have the same cute little sheep that’s on the shelf. Your valentine is so cute and yes, I have already been pinning Valentine ideas. I mean of course: idea! Definitely going to try this idea I always look forward to getting Country Living and seeing your contribution. What a fabulous idea! Love the old-fashioned warm & fuzzy feeling! Popping this one onto Pinterest! Happy 2012- I’ve enjoyed stopping in here….such creative juices. I saw this article when I read my new issue. What a great idea. Thanks so much. You never cease to amaze me…Happy New Year! I just saw this in the Magazine today and thought it was the coolest! you can be sure I’ll be flying towards my grandsons, they won’t expect it from me. Oh, I adore this! 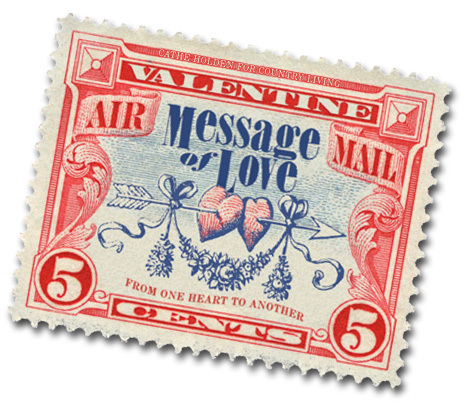 Love AND Airmail, two of my favourite things. I am now a big fan. you are so smart!!! love it. Oh my gosh! This mag is sitting on my desk at work at the library…ready to read. Congrats! I tried several ways to bring up the printable airplane valentine but the page comes up black every time. The airplane is adorable so I’ll keep trying. i keep trying to open this at the actual country living site and from this link and it says it is a password protected document? any help? What a super idea, since I am giving my husband a flying lesson…..now I can deliver it in style. Thanks! This is soooo cute!!!!! I love your stuff!!! 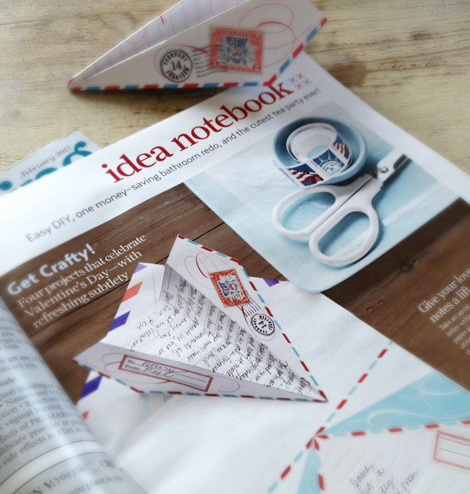 I love this idea I used to pen pal in my twenties and I look forward into writing someone again and making nice things for them. Thanks for Sharing! !